Various crystals and minerals are placed on or around a fully clothed person to induce deep relaxation, release stress and pain, and promote energy balance within the physical and subtle bodies. Crystals may be used singly or in patterns. They are placed on sites of pain, on acupuncture points or meridians, or on subtle energy vortexes called chakras. 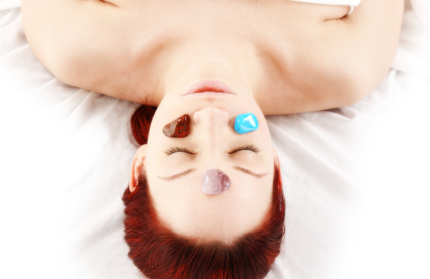 Why would the specific placement of crystals have any effect on the well-being of our bodies? It is said that there is no such thing as a miracle, just undiscovered laws of physics. Crystals have the ability to hold and emit energy vibrations. When a crystal is put in a watch the battery sends a constant charge through the crystal. The crystal absorbs the charge, and then releases it at such a precise rate it is used to make the watch keep perfect time. Crystals affect our electro-magnetic energy fields or subtle bodies which surround and permeate the physical body. These include the etheric, emotional and mental bodies, which are collectively called the aura. Crystals absorb, focus, direct and diffuse our energy fields to enable a diseased or out of balance body to find it's natural energetic rhythm once again. The appropriate crystals can be placed on the seven main chakras, which look like different coloured spinning wheels of subtle energy, running up the centre of the torso. These link the subtle energy fields of our aura with our emotions, glands, organs, physical body parts and subtle and physical circulatory flows. This is why wearing certain crystals such as yellow citrine may uplift you, rose quartz may help to ease heartache, and amethyst may calm a busy mind and help you to sleep. If you know what effect each type of crystal has according to its colour, shape and mineral content, then you can make use of them to initiate a specific effect on the energy balance of chakras, meridians, energy, organs and emotions. Usually crystals with the points facing away from the problem area move the energy away from that area, and crystals placed with the points facing inwards recharge the body with subtle energies. For instance a pain such as a headache indicates an over-energy situation or energy blockage. A crystal such as an amethyst point can be used to move the energy away from the area of imbalance. Four amethyst points are used. Lie down and place one amethyst on either side of the base of the throat, just above the innermost end of the collarbones. The points should be facing upwards towards the head. Place another amethyst on the brow chakra in the middle of the forehead with the point facing up towards the crown of the head. Place the fourth crystal above the crown of the head, with the point facing straight up and away from crown of the head. A fifth optional amethyst can be put below the back of the head, on the cervical vertebrae of the neck, with the point facing up towards the head, if the headache originates from tight neck muscles. If you find it difficult to make the crystals stay in place you can tape them on with micropore. Relax with the crystals in place for 5-15 minutes, or for as long as it takes for the headache to ease. Drink plenty of mineral water following the treatment. There are many layouts to choose from, so the therapist either works intuitively or dowses with a pendulum for the right layout. For instance the "Seal of Solomon" layout can also be used to relieve pain or stress. Six quartz points in a star formation can be placed around a painful spot, or around the whole body. A malachite stone can be placed in the centre to accelerate the dispersal of energy. Another layout called "The figure of eight" uses quartz crystals in the shape of a figure of eight to increase the movement of the body's electro-magnet energy where it has become sluggish. Does it really work, or is it a gimmick? One of the best ways to find out whether a painless complementary therapy works is to try it out on an animal, small child or a plant. They do not need a belief in the treatment's efficacy, nor do they have the ability to understand the treatment, or suggest that the result could be just coincidence. Much of my research in crystal therapy has been done with animals. Animals seem to be able to sense the beneficial electro-magnetic qualities of crystals. One of my wolf dogs loves crystals she carries a crytral around in her mouth all day long and always goes to sleep with a paw over the huge lemurian crytral I keep on the floor. She asks for a crystal to be rubbed down her back. Crystals can be placed on around the sick animal or child, but it is usually more convenient to place crystals on a drawing or a photo of them for a set period of time. Alternatively a gem essence can be added to their drinking water. Gem essences can be made in the same way as a flower essence by putting a gem in spring water and exposing it to sunlight for a couple of hours. Then brandy is added to the water to preserve it, and then a few drops of this mother tincture are used to make a stock essence. Then a few drops of the stock essence are then added to drinking water. However, even drinking water which has had a non-poisonous gem in water put in it overnight can have beneficial effects. Take the gem out before drinking it. Pearl is excellent for calming a traumatised animal or child, emerald is good for the cat that keeps vomiting up fur balls, and ruby is good for improving energy. Do certain crystals clash if used together? Some crystals such as ruby or garnet enhance vitality, and others such as amethyst, malachite and lapis calm over-energy states. In general warm coloured stones - red, orange and yellow - stimulate energy flow, and cool colours - blue, green and violet - generally calm overactivity. In a treatment some areas will need calming and others will need stimulating, but if you were to use a stimulating stone and a calming stone on the same spot it would simply neutralise the effect of each stone. Can I use crystals to enhance the energies of my surroundings? This is a huge subject, which many practitioners of Feng Shui go into in detail. Briefly for the lay person it is helpful to place a clear quartz point on top of computers and televisions, because they create electro-magnetic fields that adversely affect our energies. The crystals need cleansing regularly in clean water to prevent a build-up of electro-magnetic energy from the source. Quartz crystals can also be placed in windows or on windowsills to absorb or deflect adverse external energies, such as those emanating from electricity sub stations or pylon lines. The crystal points need to face towards the source of the adverse energy. How can I use crystals on myself for my own healing? You can wear the appropriate stone for healing as a bracelet, necklace or pendant. The healing may take some time as the crystal is only in contact with one small area of the body. For protection from adverse psychic energies crystals such as turquoise, labradorite or iolite can be worn over the chest. You can place crystal layouts on yourself as described earlier. You can also put the appropriate stones or layouts on a photo or drawing of yourself for an appropriate period of time. There are many good books to help you find out what crystals you need for various imbalances. Books such as "Love is in the Earth" by Melody (Earth Love Publishing House, ISBN 0 - 9628190 - 0 -X) give detailed descriptions of each crystal, and a few, such as "The Complete Illustrated Guide to Crystal Healing" by Simon Lilly (Element, ISBN 1 - 86204 - 326 - 4 ) describe the various crystal layouts you can use for healing. There are also many crystal workshops and training courses now available. Full training courses under the umbrella organisation ACHO usually take two years part-time, and include crystal geology, anatomy and physiology, colour healing, counselling, and practical layouts etc. A full list can be found at their website www.crystal-healing.org. Use the highest quality stones. High quality stones are undyed (if possible), have no chips/fractures, and are not irradiated (to enhance color). Use rounded stones for gemstone therapy. The properties listed here are for rounded, highest quality gemstones. Non-rounded stones may have different effects. Amazonite: Improves self worth. I find that I have more confidence when I wear this stone. Amber: Lift heaviness. Amber is great at lifting the heaviness of burdens -- allowing happiness to come through. Amethyst: Spiritual Upliftment. This is also the present carrier of the purple color ray. I wear a short necklace of this when I need to communicate effectively. I place this on my stomach/liver when I have stomach problems. Apatite: Communication. I wear this stone when there has been a misunderstanding. It is also helpful for fighting viruses. Aquamarine: Remind one of the ocean of love and mercy. It can help one understand difficult situations from a love-filled viewpoint. Wear an aquamarine stone or gaze into an aquamarine crystal if you are experiencing a lot of grief. Blue Aventurine: Circulation. To increase happiness and to help clear my congestion. Green Adventurine: Physical healing. Place stone around your neck or on the area where healing is needed. This is a good stone for overall healing support. For major illnesses, use emerald and/or frosted quartz as well. Transparent Aventurine is extremely powerful - however, it needs washing daily (dry flat). Immature transparent aventurine will fade. Cape Amethyst: Inner alignment. This stone will balance the inner bodies (emotional, spiritual, etc.) as well as provide more energy. Use a very small sphere (4-6mm) on acupressure points for 1-5 minutes to clear energy blockages. For larger spheres (8mm), use less than a minute. Also good for arthritis - wrap strands of cape amethyst beads around aching joint. Carnelian :Balance creativity and mental processes. Good to stop wheezing from allergies, I placed this on him. This works best with natural carnelian (bright orange). However, clear man-made carnelian will work as well. Wash carnelian under water after wearing it. Carnelian is the carrier of the orange ray. Citrine: Upliftment. Wear this to help align my spine. Place a strand along your spine or wear it around my neck. Citrine encourages the yellow ray to support the body. This stone also helps one process energy work. Coral: Emotional Foundation. Coral protects and strengthens one's emotional foundation. Emerald: Physical and emotional healing. This is the strongest physical healing gemstone that I know. Use it by placing it on the area which needs healing or wearing it around my neck. Emerald is the carrier of the green ray. Green Fluorite: Hormone Balance. This stone has been helpful with hormonal changes such as PMS and menopause. Purple Rainbow Fluorite: Change. Helps one get out of ruts. Jade: Relaxation. Jade works wonders when placed on a sore shoulder or back. Use it to reduce tension in your life. You may find yourself calmer when you wear jade. Kunzite: Emotional Support. Use this stone to help your mind and your emotions be in sync. Lapis: Understand the mind. Expanding your viewpoint. It is good for connecting the heart and the mind when worn over the heart. Leopardskin Jasper: Bring what one needs. Note that it doesn't necessarily bring in what you want. However, it is a wonderfully supporting stone. Mahogany Obsidian: Decision making. It has been helpful in healing my gums as well. Malachite: Bring harmony into one's life. Do your meditations with malachite to gather knowledge on life purpose. Moldavite: Grounding stone. Really puts one in their body. This is extremely strong -- you may wish to try black onyx for grounding first. It is rumored that it helps you talk to other sentient beings (humans and whales and dolphins). I haven't tried this. Grey Moonstone; Helps one accept other stone's powers by cleansing blocks. This can be hard to wear. Orange Moonstone; Helps one accept other stone's help by comforting you. This is less powerful than white - but helpful when one really needs a certain stone. White Moonstone: Helps one accept other stone's help through highlighting the others effects. I like this moonstone the most. When worn by itself is balances yin/yang. Moss Agate; Get in touch with nature. Plant knowledge. Mother of Pearl: Protection; Know mother's love. This stone is a great protective stone. Black Obsidian; Grounding stone. Gaze into it for a very short time (1-5 minutes) each day for 3 days when you need insight into a problem. Use black obsidian when you are unable to understand what other stones are trying to show you. This is a very strong stone. Black Onyx; Helps one to change bad habits. This is great when used in a necklace. It is a great grounding stone. Black onyx is almost always dyed. Mexican Onyx; Helps one sleep better. Opal: See possibilities; discover a broader view. Use opal to see all the possibilities in a situation. You will find it very freeing when you feel blocked in a situation. Fresh Water Pearl; Enable one to accept love. See the good parts of oneself so you can love yourself and others more. Poppy Jasper: Gain a positive outlook. Frosted Quartz: Balance. It is wonderfully soothing. Rose Quartz: Emotional balance. Very good for expressing and soothing emotions. Try to find undyed rose quartz. Gold doesn't mix with rose quartz. Rhodonite: Emotional support. Helps one take the next step emotionally. Rhodocrosite: Change. Gives one confidence while making desired changes. Very supportive. One can make large changes very quickly with this stone. Ruby: Love; Open the heart. It allows you to overcome fear. Carrier of the red ray. Sapphire; Mental clarity. Clear mental garbage. Carrier of the blue ray. Sodalite: Protects from external negative energy. Use it by computers to help reduce the damage from EMF. Sunstone: Enhances contemplations. Makes your meditations clearer and helps you to remember your dreams. Use it for a few days in a row when you find you have not been remembering your dreams. Sugilite: Absorbs garbage from wearer's aura. You will feel lighter when you wear this stone. It uplifts you and gives you more energy. Tanzanite: Changes. Uplifts and opens the heart. Green Tourmaline: Promote male balance and physical healing. Pink Tourmaline: Promote female balance and protection. Tree Agate; Introspection. Helps one view themselves with more clarity and see the world through a broader viewpoint. Discover the properties of unknown stones for yourself. Find out what is true for you. Keep your stone with you as much as possible for a week. Place it next to your bedside when you sleep at night; wear it or put it on your desk during the day. Pay attention to your moods, your interactions with others, and your dreams. Do you have any insights? Try asking the question, "What does this stone do?" before going to sleep. It may help your unconscious/higher self/your inner guide tell you what the stone does for you. Here is my favorite Gemstone Therapy reference. Gemisphere (formerly Golden Age Institute) has a catalog which is really nice. It features nice pictures of each necklaces as well as its therapeutic properties. They offer very good classes and home study courses are available. This is my favorite reference. Everything about these gemstones works as described. This information has helped me make desired changes as well as help others. This is an extremely comprehensive book. There are hundreds of stones explained in detail. Additionally, it explains crystal configurations, programming crystals, and practical applications. A companion book for Melody's "Love is in the Earth." A fun way to learn about gemstones featuring colorful gemstone cards. Learn how to use your intuition to discover what stone to wear. Though I have not found gemstone elixirs to be very effective, the many descriptions of the gemstone properties are quite accurate. This is a good reference book for anyone involved with crystals. It gives great details on various forms and types of crystals. A comprehensive, easy-to-understand guide to the use of crystals and gems for internal growth, healing, and balance in your daily life. I find that using Gemstone crystals needs MUCH more practice and knowledge than gemstone spheres. Second book in the series. Very well written. Third book in the series. Very well written too. Very sweet book that goes into the spiritual properties, healing properties and energies of gemstones. Good references, good explanations, and nice pictures. Learn how to choose gemstones and work with chakras. Crystal healing methods from the Apache and Cherokee tribes. This is a very helpful and informative book. A very nice quartz crystal therapy book. It discusses many different aspects involved in healing. This is a book oriented towards vedic medicine and gemstones. Very interesting. This book explores a little-known branch of gemology dealing with India and its system of astrological gemology. Though not a gemstone therapy book, this book features 5 exercises designed to balance the chakras. These exercises work extremely well. I use them every day. Practice at your own pace. What a wonderful healing book. Recommended by others; not reviewed.